Yesterday I worked from home since I had Comcast scheduled to come out and fix my Internet issues. I had been intending to upgrade to Windows 10 for a while, but hadn’t done it yet as every evening I decided I’d rather play games than deal with waiting on the upgrade and fixing any issues afterwards. Since I was at home for the day though it seemed like an ideal time to upgrade. This was actually the third time I had gone through the Windows 10 upgrade process. I upgraded my old netbook and my wife’s laptop pretty quickly after release. So the actual upgrade itself was pretty uneventful. I did have a bit of fin getting it started though. I had “reserved” an upgrade via the system tray icon months before, yet clicking on it now to start the upgrade just had it sitting on the initial window. To actually start the upgrade I had to get the media tool off of the Windows site. Not a big deal, but it felt like an ominous omen. Despite my difficulty getting started, the actual upgrade went off without a hitch. Even my Nvidia drivers seemed correct, which I’d heard were problematic initially. Unfortunately when I tried to launch the Nvidia Experience program to make sure my drivers were up to date the program hung. I tried uninstalling, rebooting, and re-installing to no effect. What did fix the application hanging was checking the “clean install” option during a custom install. Besides Nvidia, I also had a slight issue with Cryptic’s Arc launcher. I was getting an unhelpful error dialog when trying to launch any of the three MMOs I had installed. I’m not sure what the cause was, but I found that launching the individual games from the Start menu first fixed it. But that was it! Considering I was upgrading from Windows 7, I’m pretty impressed that I didn’t have more issues. I haven’t gotten to do much with it yet, so I can’t say whether there have been performance benefits of 10 over 7, but I didn’t notice it being any slower which is a performance increase of a kind. My plans for the holiday weekend are to launch my Jool exploration, play some Golem Arcana, and get going again on my MMO multitasking experiment. Saturday night I sat down at my gaming desktop to check in on some MMOs that I hadn’t logged into in months, namely LotRO, Rift, and Defiance. I spent about 15 minutes in Rift moving all my inventory over to my Vault and then redeeming all of the patronage rewards that had been stacking up before canceling my subscription. I haven’t touched the game since before it went free-to-play, it’s just too much work to get back up to speed with all of the soul changes, and had been waiting on my last renewal to run out. Then I hopped into LotRO just intending to pay my housing upkeep, but I ended up fiddling around and discovered that the inventory system changed. I was able to merge all my individual bags into a single window! Maybe I’m easily amused, but it makes thing so much easier when only one large window pops open instead of six little windows. I imagine people running mods have been enjoying something similar for a while, but I really dislike messing with mods for MMO clients. Anyway, I ended up playing with my Hunter a bit and figuring out the big class changes from a few months back. I had just finished and ported back to where I’d left off questing when the game crashed. I chalked it up to LotRO being old, after all it is still slow to load and still doesn’t support full-screen windowed mode, and decided to move on to Defiance. Watching the Season 2 premiere got me curious about what state the game was in. When I logged in, I found that I had more than a dozen items to claim in the shop. Once I got my inventory squared away, I got on my ATV and headed out only to have the game crash. Again, not thinking anything of it, I relaunched and noticed a button to update appearance on the login screen, and decided to have a makeover. While tweaking my character’s appearance I had the screen go black and then a Windows message popped up that my graphics kernel has crashed and restarted. I had recently update my drivers and wondered if that had been a mistake, but went ahead and went back to fiddling with my character’s appearance. Then red lines started to appear on the screen, followed by my machine rebooting. When my machine came back up in safe mode and there were still red lines on the screen, I knew it wasn’t the drivers. Or at least wasn’t only the drivers. I’ve never had a video card die on me before, especially one that’s only a coupe of years old. I’m not sure when but sometime in the last five years I’d upgrades the original GTX 275 that I’d used in the build with a GTX 580, so it’s no older than that. It has seen pretty constant use though. Regardless, I took a trip to Fry’s on Sunday and picked up a new GTX 760, which isn’t quite top of the line, but is still better than the 580 without being ludicrously expensive. Plus my motherboard is old enough to be PCI-express 2.0 not 3.0 so I’m already capping my performance with the 760 as it is. I bought Dishonored from Steam. I considered getting it for my Xbox, but didn’t because I was hoping that it would be opened up for mods eventually and because the load times for PC were much faster. The load times were a major decision point for me as I don’t play many stealth games and I knew I would want to be able to obsessively use quick saves to avoid getting frustrated and I didn’t want to spend half my playing time starting at loading screens. The game begins very similarly to Skyrim, although instead of a wagon ride to the executioner’s block, you are on a boat headed to meet with the Empress. Things go bad quickly with the murder of the Empress, disappearance of her daughter and heir, and Korvo, the main character, being framed for the murder then imprisoned and tortured. The rest of the game involves escaping prison and then finding out who was behind the murder and bringing the evildoers to justice. Unlike Skyrim, Dishonored is not an open-ended game. It is split into nine missions plus some interludes, with each mission having a specific goal that Korvo must accomplish. The freedom in Dishonored comes from the many ways in which you can achieve the mission goals. All of the missions have optional objectives and offer both lethal and non-lethal ways of completing the missions, plus you have myriad choices in how to make it through the mission map and deal with obstacles and soldiers. The actual stealth gameplay reminded me quite a lot of Rocksteady’s Batman Arkham City. So much so that I overly relied on sleep darts and the Blink and Dark Vision powers for more than half of the game. While it was fun to play that way, I was missing out on some fun by not making use of Possession and Bend Time as well. I completed the game with the low chaos (good) ending in about 20 hours. I chose non-lethal solutions to all of the missions, although I did blunder around a bit in the first few missions so I didn’t completely get away without killing everyone. I say this just about every time I finish I game I enjoy that offers multiple endings, but I’m looking through to playing Dishonored a second time. Of course I never finish these second goes, although I think I have a pretty good shot and succeeding with Dishonored. At one point in a mission, I was trying to get past a locked door but I couldn’t find the key. I realized could keep sneaking around hunting for it, which would take a long time while trying to keep from getting spotted, or I could look on YouTube, or I could make a save point and just go on a rampage until I found the key. I ended up taking the rampage option and had a lot of fun cutting loose with Korvo. While I never did find the key, I did figure out an alternate way past that door and had a lot of fun doing it. In the time I spent playing more assassin than thief, I found that the game played quite a bit differently, and I think this’ll make a difference in keeping me engaged a second time through. I did something over the weekend I haven’t done in a while. I played no MMOs. I did played several hours of the Torchlight 2 beta, but I spent a lot of my gaming time reading gamebooks. I played through Tin Man Games’ Gamebook Adventures 1: An Assassin in Orlandes and started on Michael J. Ward’s Destiny Quest: The Legion of Shadow. 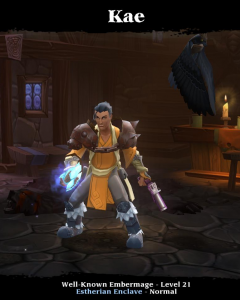 Torchlight 2 was lots of fun. I think they’ve improved quite a bit over the sequel, but it’s been years since I played it so my memory if the first game is fuzzy. There seems to be more customization for your character and there’s definitely more for your character’s pet. Combat still feels great, and advancement is open enough that each of the four classes can be played very differently. I played about five hours as an Embermage and another four as an Outsider and had a blast with both. Luckily the beta “weekend” runs through Tuesday, so I’ll get some more time to play tonight. I plan try out the Engineer so I can see what a melee focus is like. 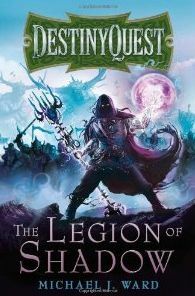 My gamebook kick started with an email about my hard backed copy of the Destiny Quest Book 1 re-release by Gollancz. That got me to pick up the original self-published edition that I have, and that got me wanting to read (or should I say play?) some during lunch breaks last week. DQ1 is a bit massive to haul around with me, plus it’s signed by the author, so I’d rather not get it too worn out or drip ketchup on it. Instead, I checked on the Android market and found that Tin Man Games has started porting their game books from iOS to Android, so I bought their first book, An Assassin in Orlandes (store link). Assassin is more of a classic style gamebook. Its a linear story but still interesting and fun, and it is also much easier to come to a bad end or die. Dieing while reading a gamebook in an app has been a new experience. With paper gamebooks, I usually go back a section when I come to a bad end. It is cheating, but it saves me time and hassle from starting over and making all of the sale choices again until I get back to the spot I wanted to be in. Fortunately, Tin Man Games accommodates this a little bit by allowing multiple modes and offering bookmarks. In the Classic mode, you’re allowed three bookmarks which you can return to at any point. You can’t move a bookmark though, so once one is placed that’s it. Bookworm mode is identical to Classic as far as character creation, but you’re allowed ten bookmarks. The only difference is finishing the book on Classic unlocks the ability to cheat on dice rolls (which is nice for exploring all of the plot branches). There’s also a Beginner mode forward readers new to the genre. It allows ten bookmarks and also changes the character creation process to allow for more powerful characters. Assassin was well worth the $4.99 for their app. Of course that might seem expensive for an app, but that’s what a paper version would cost, and the app adds the convenience of tracking combat and inventory for you, which I think is well worth it. Tin Man Games has app added in some extras. There’s a nice map, some additional background info on the setting, and even achievements. I’ve already picked up Gamebook Adventures Volume 2, The Siege of the Necromancer (store link). Tin Man has eight gamebooks so far for iOS, hopefully there rest come to Android as well. Pro-tip for the next time you decide to do some Spring cleaning on your computer like I did recently. Make sure before you spend the weekend replacing your primary hard drive and reinstalling Windows and hundreds of gigabytes of games, that you are sure that the new drive is the correct speed. I mistakenly used a 2TB drive that I’d originally intended to use in my Blacx SATA dock. That’s important because I usually get 5400 RPM drives for that purpose as they generate less heat, and the speed isn’t that necessary. Unfortunately a 5400 RPM drive is noticeably slower on a Windows install, especially when launching the Skyrim Creation Kit and loading all of the required data files. After much cursing, some drive imaging, trying a 3TB drive that couldn’t be partitioned correctly as a bootable drive, more cursing, and then reinstalling (again) on a 1.5TB drive, everything is back to the way it should be. At least for now, I’ve decided to pass on Kingdoms of Amalur: Reckoning. In a rare case where comments from friends are echoing official reviews, the game seems to have a pretty forgettable story. That was the part that made Reckoning a questionable purchase. Then, while watching the Destructoid video review, I heard two words that sealed it’s fate: boss fights. I had two words of my own when I head that: no thanks. Sorry, but I immediately had Deus Ex: Human Revolution flashbacks when I heard that. Also, just to prove that there’s other games where boss fights ruin things, I’ve never finished Dawn of War II: Chaos Rising because the boss at the very end is ridiculously difficult. I would definitely be more tempted if I didn’t have Skyrim sitting on my computer waiting for my return, not to mention the fact that Bethesda just released the Creation Kit for the game, but for now I’m going to pass. Besides, I’m sure it will show up on one of Steam’s ludicrously cheap sales. On Friday I decided to do spring cleaning on my desktop and reinstall Windows along with everything else. I hadn’t intended to. Originally, I was just going to do a backup onto a new 2 TB drive that I’d bought, but then I started thinking about just moving my current 1 TB to a secondary slot and installing everything from scratch. I’d been having some weird errors sporadically during shutdown, and besides, and it had been two years since I installed the OS. I always forget how much time it takes to do a fresh install. I’m not talking about Windows either. Windows 7 is actually pretty quick to install and is mostly an automatic process. No, what’s taken the most time has been putting all of my games back on. Since this was supposed to be a clean start, it didn’t make much sense to just copy over my old installs for my games. Instead I downloaded them all. Interestingly, the install processes for Star Trek Online, Champions Online, and Lord of the Rings Online have all changed somewhat. First they all had a Pando pre-download that’s much more obvious than the way it used to be handled. I like that it’s more upfront. Second, both Cryptic games installed to my C:\users\public folder. Besides those three MMOs, I reinstalled Star Wars: The Old Republic and Rift. I’m a bit surprised that I put Rift back on my machine. My primary rule for doing these computer cleanings is that I don’t install anything back on the drive unless I’m going to play/use it. For instance, while I did reinstall Steam, I didn’t download all of my games again. I just reinstalled Skyrim and Orcs Must Die. I didn’t even remember that I’d bought the full version of OMD, which is another reason not to reinstall my full Steam library. So I started thinking about it and realized that I haven’t actually given up on Rift as completely as I thought I had in my January writeup. Although, I believe it’s more about what Trion’s doing than the game itself. So that was my weekend, and a good part of Monday. I’m still not done really, but I’ve done as much as a I need to for may day-to-day. Most of my pictures and videos and such are stuck in a Prior Install folder that I’ll pull stuff out of as I need it. Sometime in November, I’ll take a look at what’s left in there and probably delete it all. One last thing, I really love my Coolermaster Sniper case. It’s completely tool-free, which means I was able to open it, remove one old hard drive, move my original down a slot, and insert the new drive without messing with a single screw. So nice. Before I get into what games I’m looking forward to, I wanted to mention some personal and blog related things. My wife and I are expecting our second little Kae to show up sometime in June. I’m sure that’s going to kill any time I have to play MMOs for a few months. I really dislike logging into an MMO, when I don’t know if I’m going to get pulled away at a second’s notice. When my son was born, I focused mostly on single player games, since I could pause it and go do father things without worrying about ruining anyone else’s game. Not playing MMOs will either mean that this blog goes silent for a few months, or you’ll see tons of posts as I’ll have lots of time to read, think, and write. Last year, I tried an experiment with posting consistently on week days. I wasn’t perfect about it, but I did well enough to consider it a success. I stopped doing that mid-summer though once it started to take the fun out of writing. I don’t regret doing it though as I developed some good habits and even got to the point where I started to feel antsy if I hadn’t written anything by the end of the day. Kind of like those healthy people who talk about missing the gym. I guess anyway, I’ve never felt that. Anyway, this year I’m trying a new experiment. I write a lot from my phone and from work, basically anytime that I get an urge to put pixels on a screen. Most of the time though, those posts go into the draft folder and never emerge. I always intend to edit and publish them that night, yet rarely ever do. So this year, I’m going to try skipping the editing stage as much as possible. After all, if there are any really stupid grammar or spelling mistakes, I’m going to be much more motivated to fix them if the article is public, and this way I’ll not have any regrets about not getting an opinion or idea out in a timely fashion. So now you know, if the blog stays empty it’s just because I have no ideas and not because I’m a lazy self-editor. Finally, let’s talk about some games. This is the first year in a while, that I’m not really looking forward to much. Mass Effect 3 is basically my whole list for the year. I believe this is a good thing though, because my backlog of unfinished, never played, and never installed games is getting embarrassingly massive. I still haven’t gone back to Skyrim and finished my first play through. I have the last DLC for Mass Effect 2 to finish. I’ve barely touched Minecraft since the 1.0 release in November. Then there’s my Steam library, let’s just not even start on that. So while there’s not much new I’m looking forward to, I’m still excited for single-player and offline gaming this year. While I do still have an active subscription, I’m not planning on renewing it in April. As I mentioned in my 2001 review, I had a ton of fun with the game, but between feeling so behind with all of the content updates and most of my friends playing other MMOs, I have no interest in going back. I fully expect to keep playing in Millennium City off and on as Cryptic adds new story missions and new power sets. Honestly, I’ve already started eyeing the launcher as they’ve added some cool new costume options recently as well as the Earth and Wind power sets. The cool thing about this game is I have no expectations for the coming year, so I’ll enjoy whatever comes. I’m playing a ton of TOR right now. I have a Jedi Knight Guardian in the mid 40’s (level cap is 50) and am nearing the end of the story missions. This means I’ll hit the mythical end-game soon. Generally when I do that, I start an alt and lose interest in repeating content after a few days. This is followed by moving on to another game. With TOR, I’m hoping that having some fresh class missions will be enough to keep me interested and get a second character to 50. We’ll see if BioWare manages a first in my gaming history. Interestingly, I’m already feeling like I’ve gotten my money’s worth out of TOR, so if I do end up cancelling my subscription, I’m not going to feel bad about it. I suppose that because the game really has felt like playing KotOR 3. Looking at the rest of the year, I hope to still be playing in June but I kind of doubt it given my history at level cap. Obviously once the baby get’s here, all bets are off. After taking most of the year off and then getting in a solid month, LotRO has been on hold since November. First it was Skyrim and then it was TOR keeping me from playing. Eventually, I’ll return to Middle-Earth and resume my hunter Brynulf’s journey into the Gap of Rohan. It may well be the fall, but it seems like I always go back to LotRO eventually, and that makes me happy. After an extremely rough year, I really hope that STO turns things around. The F2P launch is happening (today actually), and the long awaited Featured Episode Series Four is coming as part of the second anniversary of the game. Past February, I want to see a permanent Executive Producer hired and I really want to see the monthly Engineering Reports and Ask Cryptics restarted. I know there have been a few new hires since the PWE acquisition, but I’d like to see the team continue to grow, and start seeing that investment payoff in more regular updates of new features and new story missions. If we get to December and have seen Featured Episode Series 4, 5, and 6, I’ll be very happy. If not three FE’s (which D’Angelo doesn’t think is likely), then I want to see more single mission story content added. One thing I do want to clarify though, I’m not at all disappointed or upset with the Star Trek development team at Cryptic. I think they’ve done as much as possible given some pretty difficult situations over the last six months (if not longer).